If I get the door card off what do I do next strip it so I can get to the lock and can you remove the lock with the door closed ?? With great difficulty. The door cars is secured with three screws along the bottom, two in the handle and some poppers. I had a similar problem a couple of months ago with a non functioning passenger lock. Eventually with patience, gently hitting the outer door lock and repeatedly pulling the door handle the door cane open. I'm glad it did as on inspection of the door card I couldn't see that it would come off with the door closed. However if I was stuck again I would carefully cut a hole 3 - 4 inches below the door lock popper button and there is a reasonably large hole there for the popper rod which you might be able to work the lock with. One question though, how did it fully deadlock and then totally stop working ? Also I was told it possible to remove the door card with door closed, this is just my two pence worth. I wonder if you pull up on the door lock mechanism were the popper rod attaches to it. Honestly these locks are rubbish. On the spurious locks that is a red plastic part that you can get at once the metal panel is removed. It doesn't move that much, all I can think after that is to rip the assembly to bits. They aren't all that well made. They come in two halves as far as I remember an electric part and a mechanical part. I think you should be able to with force separate them and be able to pop the lock manually. Flippin nightmare I hate those locks. Cheap as cheap can be and quite complivated. I've managed to pop the top of the door panel off from the inside, but it is still held by the three screws along the base. I haven't got good enough access to remove the internal assembly carrier and access the lock. As far as I can see, my only option is to cut the panel off, which I really don't want to do. I've no idea where I'd get a new panel, and it would be messy and no doubt expensive. And can you not forcefully pull up the lock button ? With mine I constantly kept banging the door handle and kept pulling the exterior door handle. I know it sounds unlikely yet after about 15 minutes it unexpectedly came open. The only reason I couldn't pull the door lock button up on mine is because the last owner had fitted the wrong lock which the plugs didn't match up on and he had also left out the top locking bar and popper button. I think I got very lucky by the sound of it. Pulling on the lock button rod seems to do the same thing as pulling on the internal handle (the two are connected), but doesn't release the lock. Gosh I don't know, unless anyone else has an idea it sounds like it's gonna get messy. Personally I would rather sacrifice the door panel then perhaps damage any other trim trying to remove it. Get a new panel off a breakers yard. There's two bolts hidden under the inner door handle as well as the three at the bottom. Then just plastic poppers. I feel for you guys. Here are my tips- To avoid a whole world of pain, do everything you can to persuade it to unlock. You need extreme patience, 15 mins is nothing! Try what Jim says- repeatedly press the remote to open while slapping the door. Be prepared to leave it and come back to it if you are climbing the walls! Try a hair dryer to warm up the lock first before slapping, anything you can think of that doesn't do damage is better than wrecking the stuff you are considering. Use the key in the lock if it's a driver's side and has one. and try the same slapping tricks. If it really really won't open you will have to cut the trim off. Don't forget that's only the first step because in order to even get at the lock you will need to remove the metal panel under the trim which has the window motor attached to the back. The OP seems to have managed to remove the metal panel with the door shut but he hasn't said how yet. Remember also that you can't take the metal panel off without first lowering the window, taking out the two window clamp bolts and removing the glass. Remember to buy a new lock first (you can always flog it again if you don't use it) because once you get that door open NEVER close it again (not even on the safety catch) until you are certain that you have the problem fixed. For the same reason test the new lock thoroughly with the metal panel and trim still off. There are other less common wiring problems that can stop the lock working but weird noises on unlocking make it likely to be the lock itself. You can get dirt cheap ebay locks for T5's, the jury is out on them but I have bought one and it looks fairly well made. I will find it and figure out the easiest way to release it from deadlock when I get time but I have other big stuff going on atm. Don't forget you can't test that the new lock is working properly (with the door open in case it doesn't!) unless you first close the catch with a screwdriver through both its positions, one click is the safety catch and the second fully closed. Note- If the van is deadlocked (as it will be if you used a single press with the remote to lock it) no amount of pulls with the interior door button or interior handle will unlock it. Once you have butchered everything off you will have to try and simulate what the van normally does to unlock itself but it won't be easy because the lock itself is quite shielded and it will also be awkward to get at if it's still bolted up in position. This is why you need all that patience before you steam in... Good luck! It’s a t5 54 plate van could someone find a link to the right lock for me, there’s a few on eBay but which one ?? I got an ebay one, it worked but had the wrong plug. Honestly of I was to get another I'd buy a genuine one, I know many would disagree and I have got them 4 golfs and Octavias before and they have been ok. The t5 has a different size connector. I could have been unlucky. Just need a new lock and door card any one no where I can get a door card from one with the windie window handle ?? Need to get a spline to undo the lock any one no wot size it is ?? Well done. Be careful getting one on eBay, like I said they sent me the wrong one (plug) that was with chassis numbers as well. The vw parts guy had warned me. You guys are ahead of me. I'm still staring at a locked door. My floor is soaking wet, so I've got a leak to fix too and will check the connections to the central locking unit. I don't suspect that though, as all the other doors are working fine. ...and will check the connections to the central locking unit. I don't suspect that though, as all the other doors are working fine. The fault with the corroding connection (the one in the pic) isn't actually the connections to the unit under the seat (although it won't hurt to check that for corrosion and damp/wet). The connection that corrodes is further forward just about under the front of the seat. Some people have repaired it without taking the seat out but it's a bit of a struggle. You need to unbolt the handbrake (don't forget to have it in gear!) to get the seat out. The splice/connector is under the rubber matting. You will need to get the rubber handbrake cover off which has a little secret release button on it on the passenger side of the cover. 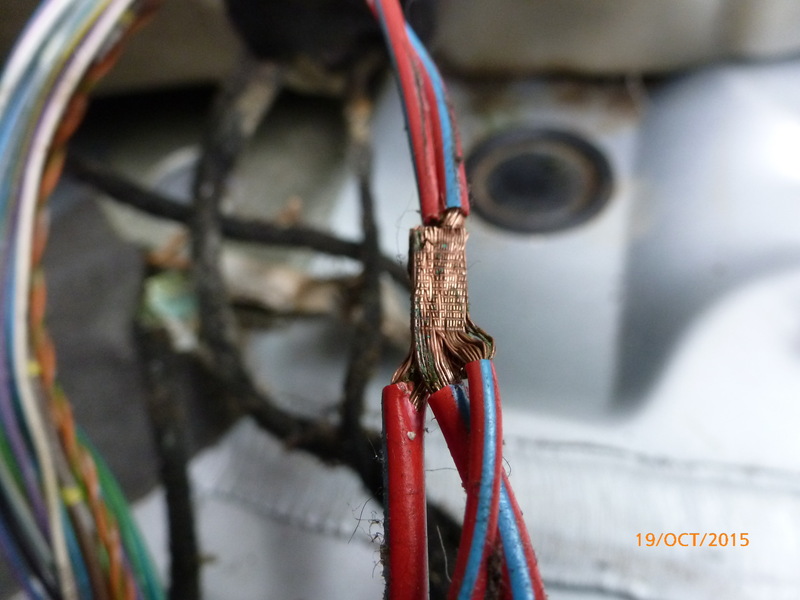 The splice corrosion fault can cause the passenger lock to fail only so yours could be that. Well worth checking first anyway. My lock worked the door ok but the plug was different. So no central locking possibly other elec stuff. Good to hear you fixed it. Nice feeling when you work out and fix something yourself. I then set about checking the splice joint in the power supply to the central locking unit, which sits under the driver's side floor mat as described. Mine was ok, a slight green tinge, but decided not to cut and solder the factory splice for fear of weakening it. Instead I put some sugro repair compound (good for this sort of thing when you can't use shrink wrap) around it and rewrapped. That took a while as I have a split charger under the driver's seat that took a while to uninstall and reinstall. Anyway, piece of mind. So then a friendly passerby shut my door while I was in the house. Back to deadlocked, but at least I have access. I'm lucky to have a friendly mechanic in our local garage. He'd said from the outset that this is an actuator motor failure. He also said not to buy an ebay replacement, which he thinks last less than a year. VW originals are good for 10+ years (my van is 2004), so I've ordered one for a painful £180. So once I get the part, I plan to open the faulty actuator and release the deadlock by splitting it with a chisel. Should be straightforward. Ahem. One final thought. Why not get a German handle with a key for the passenger side to avoid all this? Has anyone done this? In Germany, the driver's door key will release the fuel cap. Seems to be a design fault on the RHD model. Of course post Brexit we'll all be driving proper British vans, so won't have this sort of thing to worry about. Hmmm, that sounds like an excellent idea ! I wonder if there would need to be other parts as well eg actuator and possibly wiring changes also, as the key obviously has to release the deadlock first, as well as unlock the door. I'll have to have a think about that if I decide to keep my van (I'm currently trying to decide whether to keep mine or not). I hope your repair work fixes the problem without too much trouble. That is a good idea, although as Greg says you could run into some oddities. For instance the driver's door lock/actuator is different and works the 'lights on' warning. I think if you had two 'master' locks it would probably confuse the conv unit. Just needs a pioneering soul to find put! To close off my saga for future reference... I managed to open the lock mechanism by driving a chisel into it with the door still deadlocked. Access is very difficult, even once you get the door card off. The metal window carrier plate can be pulled back just enough to get in. Drive the chisel in along the joint between the white an black plastic housing of the mechanism. Thanks for getting back to us. Your experience will be helpful to others.